It's time to dust off the lawn mower! It is the first ritual of spring – firing up the lawn mower. Let’s cover a few of the questions we get asked every year at this time. How low do I need to cut the lawn the first time? Probably the most asked question we will get over the next few weeks. The old rule was to cut the lawn as short as the mower would go. Homeowners would brag about getting the lawn shorter than their neighbor. The more dirt exposed, the better. But why? What is the purpose of scalping your lawn? Is it the best thing for your lawn? Or, are you doing it just because you have always done it? Or, since everyone is doing it, it must be the right thing? Actually scalping your lawn in the spring on the lowest setting isn’t need. And, it really isn’t beneficial for your lawn. But, there is something you should do every spring – the initial spring lawn maintenance. It is common for Fescue to end up over 3” tall. 1.5-2” is a good starting height in the spring. Often Bermuda lawns end the season at 2-3” tall. Cutting it down to 1” is a good place to start the season. What is the difference? Lawn scalping is setting your mower on the lowest setting. Many use scalping to take the lawn as low as possible, often exposing some soil. But, anytime you expose dirt in your lawn you are opening up the opportunity for more weeds to germinate. Also, when you scalp as low as possible you run the risk of damaging the plant crown. Damage to the crown will result in a weaker root system and a stressed lawn in the early spring. Spring Lawn Maintenance is the practice of setting your mower cutting height at or just below the height you plan to start mowing for the season. Common practice when mowing is to gradually increase the cutting height of your lawn through the spring and summer with your lawn reaching its maximum height during late summer. If you plan on starting your lawn off for the season on the second notch on your mower, then do the initial spring lawn maintenance at that same height. Warm season turfs, Bermuda and Zoyia, go completely dormant during the winter, so removing the brown leaf blades is necessary. The leaf blades (grass shoots) are actually damaged by the winter freezes and will not green back up. In most winters, the crown, stolons, and tillers will green back up. So, only leaf blades need to be removed, not the crown or stolons. Fescue lawn before Spring Lawn Maintenance has removed the freeze damaged grass tips. Fescue lawn after Spring Lawn Maintenance. What is the right time for spring lawn maintenance? The best time is between late February and the end of March as the temperatures start to warm. The goal is to do it after the last chance for extended cold weather and before spring green up. Use the bag on your mower or rake up the clippings. Removing the clippings is always a good practice anytime you are removing more than 1/3 of the grass blade in one mowing whether it is dormant or green. If I have a cool season lawn (fescue or rye), is spring lawn maintenance needed? For the best spring green up, I would recommend mowing the lawn a little shorter than you left it at the end of last season. Fescue leaf blades have brown tips left over from the winter cold. If you remove the brown leaf tips soon, your lawn will develop better color quicker as soil temperatures warm. Do I ever need to dethatch the lawn? Dethatching is the process of removing excess thatch. 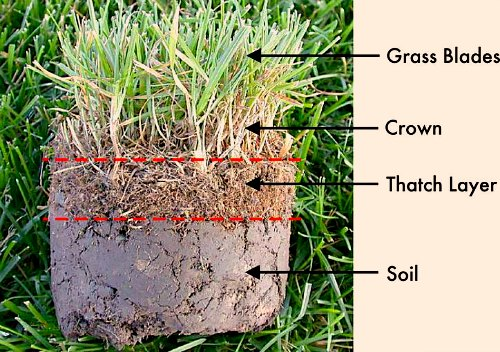 Thatch is the layer of under-composed grass clippings that builds up on the soil surface. When your lawn is healthy and you are mowing often enough, you should not have thatch build up. This is even true if you do not catch your clippings during the growing season. But, if you have a layer of more than 1” of thatch, dethatching is recommended. Use a verti-cutter, also known as a power rake, to remove the thatch before spring green up. Excessive thatch stops air, nutrients, and water from reaching the root zone and results in a shallow rooted turf. Aeration, after spring green up, is also an effective way of removing thatch and also has the added benefit of reducing soil compaction. In most cases, spring lawn maintenance followed by aeration after spring green up will cure the thatch on most lawns. In over 30 years in the lawn and landscape industry, I have only seen a handful of lawns with excessive thatch problems to the point that dethatching was required. If you have any questions concerning the practice of spring lawn maintenance verses scalping, please give us a call. (405)367-3873.